Sanwa’s got a new monster hub that just missed Halloween, the 400-HUB009. 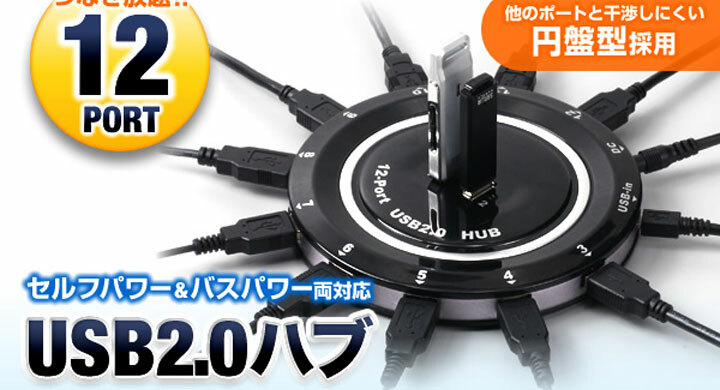 Sporting an almost unprecedented 12 ports, this round octopus hub should definitely be able to the handle the needs of all but the most USB addicted users out there. The hub’s circular shape gives every USB port plenty of room, so that all shapes of devices can easily be plugged in. There are 10 available ports around the edge of the disc as well as 2 extra top mounted ports which are ideal for plugging flash drives in and pulling them out quickly. The hub is fed by a mini-USB type input plug and an almost mandatory power adapter. Trying to run off of bus power would be horribly ill advised. The only problem with the hub is the 360 degree mess that you will have if you manage to fill all of the available ports. With the average cable sticking out at least 2 inches front and back this scary spider will take up about 12 inches of desk space. Still, this might make for some great niche applications and is reasonably priced at around $55 if it every makes it outside Japan.